Netflix ‘s (NASDAQ: NFLX) comfortable lead in the streaming space is about to be challenged by two powerful names: Apple (NASDAQ: AAPL) and Disney (NYSE: DIS) . Apple has been aggressively ordering content for its lineup, including a highly sought-after drama show with A-list stars. Disney reorganized its staff to place more focus on its upcoming streaming site and has a pending deal to buy megacontent maker Twenty-First Century Fox (NASDAQ: FOX) (NASDAQ: FOXA) . 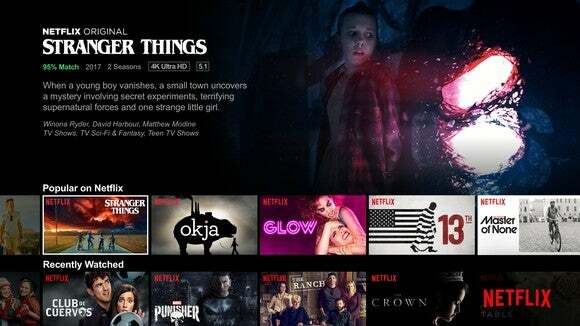 The effort and money that both companies are putting into their content strategies show that they aren’t underestimating what it will take to compete with Netflix — and that should scare Netflix. Netflix has had a comfortable lead in the streaming space, but that could change in 2019. Image source: Netflix. Apple was late to the content game. The company didn’t release its first original series, Planet of the Apps , until last June. It was a reality TV show about app creators and debuted to lackluster reviews. But while Apple may be years behind Netflix, it also has the cash to put into hiring the best talent and winning the bidding wars for the best scripts. Apple is expected to spend $1 billion on TV shows and movies in 2018. While this is significantly less than Netflix’s $8 billion content budget, Apple is just getting started. At the end of 2017, the tech giant scored a highly coveted drama series about people on morning talk shows, starring Reese Witherspoon and Jennifer Aniston. Apple is paying the stars upward of $1.25 million apiece for each of the 20 episodes, according to The Hollywood Reporter . Other shows in the works for Apple include the true-crime series Are You Sleeping? , starring Octavia Spencer, known for her roles in The Help and Hidden Figures . Apple will also revive Steven Spielberg’s sci-fi anthology series Amazing Stories for 10 episodes, with a reported $5 million budget per episode. In total, Apple has more than 10 shows in the works but is focusing on quality rather than quantity, according to Cue. Last year may have been experimental as Apple got its feet wet with Planet of the Apps , but this year Apple isn’t messing around. “We’re completely all in,” Cue said at the conference. Disney is also going all in on content this year as it prepares to launch its streaming sites. On March 14, the company announced a company reorganization into four segments, including a new direct-to-consumer division that will house its streaming businesses. The reorganization comes as Disney prepares to absorb Twenty-First Century Fox, in a deal that’s still awaiting government approval. As part of the restructuring, Disney promoted Kevin Mayer from chief strategy officer to chairman of the direct-to-consumer division. Disney also recently hired former Apple and Samsung exec Kevin Swint to help out with its new streaming division. Swint previously worked for two years as vice president of product, content, and services at Samsung; before that, he spent five years as the director of international movies at Apple’s iTunes. Disney’s new direct-to-consumer division makes sense, considering it’s gearing up to launch two streaming sites. The first one will launch this spring as a direct-to-consumer ESPN service that will work with a redesigned ESPN app. The $4.99-per-month subscription service will give users thousands of additional live sports events, as well as the full library of ESPN Films. Disney is also working on a family-friendly streaming service aimed at kids that won’t be ready until 2019. This could hurt Netflix, which doesn’t yet have a site for parents who just want shows for their children to watch. Another thing that should scare Netflix is Disney’s pending acquisition of Twenty-First Century Fox, known for shows like Modern Family and This Is Us . Disney itself is already a blockbuster movie maker, but this deal could give it the talent it needs to really put a dent in Netflix’s subscriber growth. “The way to look at the revenue opportunities, as particularly as it relates to production, is to consider the fact that what we’re buying here is significant production capabilities and, with that, the talent to produce on our behalf,” Disney CEO Bob Iger said on the latest earnings call. Not only will Netflix need to compete with Disney — the rival that is perhaps most familiar with the content space — it will also have to make do without Disney’s titles starting in 2019. Disney announced last fall that it would pull its titles from Netflix at the end of 2018 in preparation for its own streaming site. Netflix CEO Reed Hastings has been playing it cool about the upcoming competition from Disney. “We don’t see it as a threat to us any more than Hulu has been, but it’s a great opportunity for them,” Hastings said on the latest earnings call. While Hastings has to put on a strong front for investors, it’s safe to assume that Netflix execs are kicking their strategizing efforts up a notch behind closed doors. Perhaps that’s why Netflix is planning to make a stunning 700 TV, film, and stand-up comedy projects this year. Natalie Walters has no position in any of the stocks mentioned. The Motley Fool owns shares of and recommends Apple, Netflix, and Walt Disney. The Motley Fool has the following options: long January 2020 $150 calls on Apple and short January 2020 $155 calls on Apple. The Motley Fool has a disclosure policy .